AN EXCITING DAY EXPERIENCING WHAT IT’S LIKE TO BE IN YEAR 7 AT WISBECH GRAMMAR SCHOOL; WITH BITE SIZE LESSONS IN SCIENCE, TEXTILES, DESIGN & TECHNOLOGY, PERFORMING ARTS, MATHS, LANGUAGES, FOOD & NUTRITION AND MUCH MORE. We did it! Saucony Cambridge Half Marathon arrived and Team Fens donned our running gear and braved yet another wet race. This one was special however, because for once I ignored the time on my watch and ran for fun with friends. The support was fantastic and the scenery was just beautiful. I completed the 13.1 miles with a great big smile on my face, not only knowing I had raised some much needed funds for Cambridgeshire Deaf Association, but also because I realised running doesn’t have to be about racing. I’m pleased to say CDA raised over £1,195 through fundraising. Our April issue, you will be pleased to hear, isn’t full of photos of me during my race, but instead celebrates all things Easter. We’ve got some egg-cellent events, we visited an egg-ceptional chocolatier and eggs-plored Ramsey Rural Musuem (sorry, that was perhaps one pun too many). Basically, we’ve had a lot of fun this issue and with the weather warming up, I can’t wait to bring you more stories from across Fenland. One final quick note to say Happy Anniversary to The Fens Wisbech. This month marks a whole year since our launch issue in April 2018. What a wonderful year it’s been. The biggest of thanks must go to our brilliant advertisers and readers. You support the publication more than you’ll ever realise and it’s an honour to publish it. THE FENS is published by Barley Media. Care is taken to ensure that the content and information is correct, however we cannot take any responsibility for loss, damage or omission caused by any errors. Permission must be granted to reproduce, copy or scan anything from this publication. 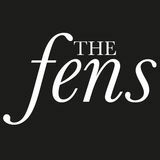 For a copy of our contributors’ guidelines please email hello@thefensmag.co.uk. Barley Media accepts no liability for products and services offered by third parties. For more information please contact our Wills and Probate team. Despite Royal Mail’s recent price rise, we won’t be increasing our prices just 30p for next day! Still paying 67p for 1st class letters? We collect YOUR post from YOUR door one day... and guarantee delivery the next day! skate park has now been completed and is already being enjoyed by so many children. My pleasure in seeing this much-needed facility being provided for the young people of Wisbech is also shared by Wisbech Town Council; it’s a fantastic addition to the ward and town as a whole.” Pictured bottom right: A £30,000 cheque from Clarion Futures Communities is presented to Fenland District Council towards the Wisbech Skate Park project, as Cllr Peter Murphy, the Council’s Portfolio Holder for the Environment, cuts a ribbon to officially open the new facility. He is pictured with young scooter users, along with, from left, Cllr Laura Cobb, Lizzi Wales and Kerrie Tonks, Youth and Community Coordinators for Fenland at Cambridgeshire County Council, Wisbech Town Council clerk Terry Jordan, Oasis Centre Manager Chris Stevens, Maria Walker, Neighbourhood Investment Officer at Clarion Futures Communities, Phil Hughes, Head of Open Spaces at FDC, and Cllr Andy Maul. Your pet in safe hands... always You love your pet with all your heart and you do everything you can to keep them happy and healthy. But do you worry who will care for them, if you no longer can? Peace of mind with Pet Promise Pet Promise is our special promise to care for your pet should they outlive you. It’s free to register, and by taking this simple step, you can rest assured that your best friend will always be in safe hands. We’ll make sure they have everything they need, from nutritious food and a warm bed, to fun activities and plenty of cuddles. At the same time, we’ll strive to find them a loving new home. While nothing can replace the special bond you have with your pet, we’ll take great care to match your pet with a family that’s perfect for them. Loving care at your local animal charity At Wood Green, The Animals Charity, we’ve been looking after pets in need for 95 years. We’re dedicated to giving them the best of care at our rehoming centres in Cambridgeshire, London and Hertfordshire. It’s free to register Getting peace of mind with Pet Promise is very straightforward - and it won’t cost you a penny. We promise not to share personal details of our supporters. You can change the way you hear from us at any time by visiting our online permission portal at woodgreen.yourpreferencecentre.com or contacting us at Wood Green, King’s Bush Farm, London Road, Godmanchester, Cambridgeshire, PE29 2NH or visiting public.fundraisingpreference.org.uk and searching Wood Green, The Animals Charity. her certificate and a bottle of champagne with Wisbech Partners, Richard Meadows (left) and Keith Day (right). maintained for the whole community to enjoy. to Whittlesey. Richard has been involved in the organisation of Whittlesey Straw Bear Festival since its revival 40 years ago and has also been a mainstay of Whittlesey Christmas Lights Committee for many years (now in the role of chairman), helping to ensure the town’s lights improve year on year. He is also an active member of Whittlesey in Bloom, assists at the Summer Festival in September and the Christmas Extravaganza, and is also the duck mascot at the Whittlesey Mayor’s Charity Duck Race, held annually on Easter Monday. Runner-up: Delvin Smart. Delvin received two nominations for two very different projects. One was for his volunteer work at Wisbech Community House, and the other for his efforts to support the People and Animals UK charity. One nominator described him as “a superstar of the community”. Winner: Andy Maul and Vikki Holmes, for their help in setting up the Grub Hub at their café, Bygones in Wisbech, with the 50 Backpacks for the Homeless charity. Runner-up: Steven Hubbard, for helping his neighbours to recycle and organising a new communal bin area for his street as part of his role as a Getting It Sorted volunteer. Winner: Bernie Wing, for his selflessness, dedication and sportsmanship going back 60 years. Boasting a successful boxing career before retiring, Bernie has shown exceptional devotion to his sport and subsequently to his local community by coaching young and old alike at March Amateur Boxing Club. He also passes on his boxing knowledge and skills at local schools and clubs. Runner-up: Manea Youth Football Coaches. Coaches Steve Taritisimo, Simon Millward, Mark Walker, Matt Doggett, Jamie Chilcott and Tom Cave selflessly give up their time so youngsters in the village can play football, and are helping the club go from strength to strength. GROUP, CLUB OR ORGANISATION BENEFITING THE COMMUNITY Winner: The Whittlesey Dance Club. Freya and Albert Pattemore, Linda Long, Roger Brown and Patricia Smith received the award for the weekly dance club they run at the town’s Manor Leisure Centre. Runner-up: Wimblington Summer Show Committee. The dedicated team volunteers their time to organise the one day horticultural show for the benefit of the whole community. JUDGES’ SPECIAL AWARD Winner: Roger Reader, for the decades of tireless dedication he has given to village life in Murrow and Parson Drove. Roger founded the Parson Drove Car Show, which raises thousands of pounds for charity, and is involved with many community organisations including Murrow Village Hall, Parson Drove Amenities 95 and Parson Drove Street Pride. He is also a key holder for The Cage, opening it up to the public during the recent Heritage Open Weekend, and his passion for history has seen him involved in many projects. Runner-up: Dulce Loureiro. Nineyear-old Dulce was recognised for the commitment she gives to her voluntary role as a young helper at The Spinney Adventure Playground in Wisbech. A hardworking young lady, Dulce takes her role seriously. a future for autistic people who wanted to work but struggled to gain employment. “In the early days, Ash and some of his autistic friends would come round and help us package chocolates. Before long, we needed more space and employees.” The couple even involved their daughter, Mina, who works in London as a branding expert. Her creative talents produced the eye-catching logo and she is still responsible for the packaging designs of every product. individuals. They help in various aspects of the business including making, packaging and selling chocolates. We spoke to Greg and Oliver, who have both been working for Harry Specters for over two years. In Greg’s case, it was the first employer who had given him an opportunity. What started as work experience led to a full time position offer. He is now Mona’s assistant chocolatier and was extremely proud showing us around the unit. We’re thrilled to be giving one lucky reader an Eggism Easter Egg. 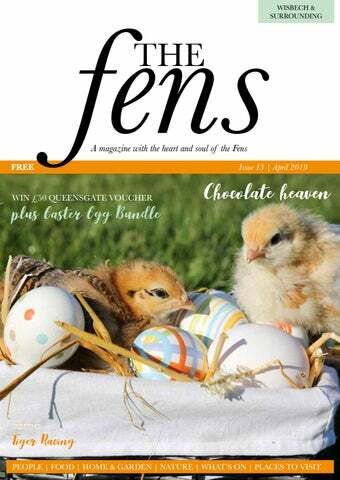 To enter, all you have to do is email win@thefensmag.co.uk with your favourite chocolate flavour by April 10th. Please ensure you include your full contact details including postal address and the mark the emails: Eggism. NEED A QUALITY ROOFING SERVICE? Quality prices Qualityplants plantsatatwholesale wholesale prices EVERYONE WELCOME EVERYONE WELCOME A wide selection of plants and trees available Fantastic of hardy shrubs and trees grown grown and range sourced from our nursery and sourced from our nursery. Sue Bates Artist Cards and framed prints of flowers. Cakes and Daisies Range of Cakes and Bakes, Wedding Floral Display, together with Hand Tied Floral Bouquets. YOUR GARDEN IN April Spring should be well under way this month with daffodils in full flow, their bright flowers enough to cheer up any dull day. Blossom trees will be blooming and fresh growth will be appearing on plants everywhere. ‘April Showers’ are common but don’t be deceived by sudden bursts of rainfall – you may need to start watering plants more regularly on dry, bright and windy days. With longer days and stronger sunshine growing conditions are continually improving and the warmer weather will give us all the opportunity to get busy in our gardens. ESSENTIAL JOBS FOR APRIL KILL WEEDS Getting on top of weeds early in the season means that you should prevent them seeding and becoming a problem. Hoeing the border once a week works well. Perennial weeds, such as dandelions, will come back if they’re hoed off, so to get rid of them permanently by using a weed killer. it may become damaged and unhealthy. We don’t want it to vanish completely! 4. Kill moss and weeds If you haven’t done any gardening over the winter, you might notice an abundance of moss and weeds in your lawn. Spring is the perfect time to spray your garden with weed killer, as well as giving your grass the feed of nutrients it needs to grow healthily. 5. Sow seeds to replenish bare patches If you notice that your grass is full of bare patches after the first cut, don’t panic: you can still have the perfect lawn by the end of the season. Simply sow more seeds to replenish the patches. The spring weather is perfect for growing new grass. To buy a refurbished mower with a warranty, visit Fenland Spirit Services 28 Ten Mile Bank, Littleport, CB6 1EE or call 0775 383 6499. WORDS GARRY MONGER ILLUSTRATIONS GARETH MONGER The Octagon, a Georgian Chapel of Ease to the parish church of SS Peter and Paul, was built under an Act of Parliament of 1827. A brick building, faced with stone and designed by William Swansborough, it consisted of a chancel, octagonal nave, bell turret and a porch facing the Old Market and provided sittings for 800. The lantern was an imitation of that at Ely cathedral but, sadly, the construction was such that only twenty years later, due to defective foundations, it had to be removed and was replaced with a coronet of battlements and pinnacles. There are a number of extant Fenland church towers crowned with octagons, some of which predate that of Ely cathedral. A low wall topped with iron railings was located between the front entrance steps and the footpath and a graveyard is to the rear of the chapel. Parts of the Octagon lantern found their way into other local buildings. Thomas Peatling (d1881), a brewer and wine merchant, built Leverington House in about 1852, incorporating portions of the recently removed chapel lantern. headstones are overgrown. The water drinking-fountain and trough were removed from the Old Market and re-erected on Lynn Road where they are still located. Nowadays they play their part as planters for flowers, contributing to the successful Wisbech in Bloom entries. In 1897 a drinking fountain and water trough were erected on the Old Market in front of the chapel. Dedicated to the memory of Mr and Mrs Collins by their daughters, it bears the inscription Honest Water, which ne’er left man i’ the mire. The chapel’s records are held by Wisbech & Fenland museum and include registers of baptisms and burials. ABOUT THE AUTHOR Garry Monger BSc PGCE is a former local councillor, teacher and army reservist. He is a member of FenArch and other local groups working to promote community archaeology in the Fens. With our competitive rates, we're saving you time & money! Tailor made and certiﬁcated training to meet all your needs! Quality training at competitive prices! FARM TO ….. A family run farm for over 100 years. Ten minutes from St Ives & Huntingdon. Visit a variety of traditional and some more unusual animals from cows, pigs, deer to parrots and crocodiles. 50ft fresh meat counter oﬀering one of the largest selections of home produced meats in the country. With our own deli celebrating a wide range of home produced products and ﬁfty British cheeses. Visit our tearoom and enjoy homemade cakes, scones, sandwiches, afternoon teas and our traditional breakfasts. Try our new steakhouse and jiggers bar for a home produced steak. Easy Peasy Lemon Squeezy, Our relationship with black white and grey will never fade, however it’s vital to add a punch of colour this time of year. Sara Fontanella explains why we should add some vibrant shades of yellow and mustard to our lives Paris Fashion week was owned by mustard: mustard coats, dresses and even trousers. Thanks to the likes of Carolina Herrera and Ralph, this summer sizzler is here to stay for the season. Although a beautiful colour, mustard and shades of yellow aren’t the easiest to pull off, so it’s important to find tones which complement your hair colour and skin. And if you’re not feeling brave enough to wear it, you can always try an accessory! There’s no reason why mustard should just stop there! Bring fashion into the home, too. I’ve recently added a mustard throw to my house, it adds a brilliant pop of colour. Why not pick up a mustard candle or a lemon scatter cushion? It’s such a warm and welcoming colour, go on, try it and see! Shout out this month to my brother and owner of Fontanella’s Italian Retaurant on Market Street, Luca Fontanella: HAPPY BIRTHDAY!! And finally Happy Easter to everyone ...Yes any excuse for chocolate, right? The 100% Electric Nissan LEAF: Fuel consumption figures for Nissan LEAF – CO2 while driving 0 MPG N/A. Offer valid until 6 January 2019 at participating dealers only and subject to vehicle availability. Private retail customers only. Finance provided by Nissan Finance, PO Box 495, Watford WD7 1BR. Subject to status. Guarantees and Indemnities may be required. You must be at least 18 and a UK resident (excluding the Channel Islands). Terms and conditions apply, please visit www.nissan-offers.co.uk/termsandconditions or your local dealer for full details. For terms and conditions relating to Nissan technologies, please visit www.nissan.co.uk/techterms. *£500 TOTAL FINANCE DEPOSIT CONTRIBUTION ON NEW NISSAN LEAF EXCLUDES VISIA GRADE AND IS ONLY AVAILABLE WHEN TAKEN ON 5.99% APR PCP NISSAN FINANCE PRODUCT. Our dealership introduces customers to a limited number of finance providers including Nissan Finance. We may receive a commission from the finance provider for the introduction. Offers not available in conjunction with any schemes or other offers. Information correct at time of print. Model shots shown are for illustration purposes only. Nissan Motor (GB) Ltd, The Rivers Office Park, Denham Way, Rickmansworth, Hertfordshire WD3 9YS. Do you take a sharp intake of breath at the thought of embarking on your Spring ‘diet’? After all, we tend to associate the idea with ‘depriving’ ourselves for a period of time rather than embracing new ways of living and eating with permanent results. Perhaps then we should look at a healthier ‘lifestyle change’ instead, which will produce widespread positive results in all aspects of your life. NISSAN NAVARA N-GUARD TAKE IT ON, N-GUARD STYLE. Tough by design, with a commanding 3.5 tonne towing capacity and 1 tonne payload. Stylish in the details, with a premium interior and new striking black exterior features. The award-winning Navara. Take every adventure head on. Fuel consumption figures for Navara N-Guard (Euro6): URBAN 41.0mpg; EXTRA URBAN 47.1mpg; COMBINED 44.9mpg; CO2 emissions 167g/km. Firstly, what is your motive? For many patients caught in a cycle of ill health or injury, the motive is health, energy, being able to do more with those we love or to feel more confident in ourselves. To put a musculoskeletal perspective on this for our backs, knees and of course hearts, every stone we put on over our healthy weight is equivalent to carrying a full-size bowling ball around – 24 hours a day! The basic rule is; if you eat fewer calories than you use, you WILL lose weight. Try cutting down on SUGAR laden drinks and foods such as bread, cakes, biscuits etc. These are high in calories and provide only a short-lived burst of energy. Quality PAINTING, DECORATING and WALLPAPER HANGING by a professional, reliable and reputable tradesman with over 35 years experience. What about breakfast – probably the most important meal of your day. Many patients say they don’t like the idea of breakfast and a few even manage to get by on one large meal at the end of the day. But how does that affect our bodies? If we have a rhythm to waking and sleeping, then so does our digestive system. How about a bowl of porridge or natural muesli to sustain the start of your day and bring life back to your bowels? Feeling hungry later, can easily lead to binge eating on those high calorie snacks rather than healthy snacks – a banana or apple. For your main meal, before you order that pizza, try grilled chicken (without the bun!) and vegetables. Eating a large meal before going to bed, not only guarantees poor sleep but also does nothing to aid digestion or proper use of calories. What about exercise or should I say ‘activity’. Do you get involved with family activities? Swim or walk with the children, walk the dog, if there’s an escalator, take the stairs – it doesn’t have to cost money. be found on the NHS website by searching for it in the search bar. Sometimes, sticking to a plan can be difficult without any extra motivation. Therefore it’s good to set yourself achievable goals that are relevant to you; maybe you have a date mind for when you want to be able to run 5k by, or a special event such as a parkrun or a 5K running race? Having this in mind will help get you moving even on those days when all you want to do is flop on the sofa! Also, why not use it to get running as a family or with friends, being accountable for helping someone else achieve their goals will also motivate you to achieve yours: help each other out! Those who have joined Three Counties Running Club before as running novices, have gone onto run four times a week and training as a run leader for the club, with others going on to train to run half marathons! No matter what your goal is these sessions will help you to achieve it! If you would like something to train for as your first taste of a race, or do as a family, why not consider taking part in the Easter Bunny which will take place on Friday 19th April at 9am until 1pm at Wisbech Park. Registration is at 9:45am, warm up at 10:40am, 1k family run starts at 11:00am and 5k run starts at 11:30am. All the finishers will get a medal. Tickets can be purchased in advance at www.eventbrite.co.uk search Three Counties Easter Bunny Run. You can purchase tickets on the day, however they are expected to completely sell out. Remember there will be a range of stalls from children’s activates to food on the day and dressing up is encouraged! Support Workers You Can Trust At Pure Heart Homecare we understand your home is where your heart is. We know from personal experience that the majority of people feel most comfortable in their own home environment. Now recruiting for Support Workers. Full and part time contracts available. Full training provided on site. We believe you and your loved ones should be cared for with dignity and respect whether you are looking for short term cover or long term ongoing help. PURE HEART HOMECARE WILL ENSURE THIS BY: • Providing your loved ones with the highest standard of care. • Recruiting Support Workers you can trust. • Using experienced and caring staff. • Supporting and rewarding our staff to endorse our values and ensure staff continuity. ou d ry clea will n in g s y stou r em ! as the Fens. Or at least, that’s how it feels when you’re trying to bike into a headwind on an exposed road north of Chatteris. FINDING YOUR WAY There is an excellent set of leaflets available to download at www. visitcambridgeshirefens.org/cycling that cover cycle routes around Ely, March and Wisbech. Check out also the National Cycle Network, which includes a stretch of Route 63 that runs from March to Peterborough via Whittlesey: you can find it on the national map at www.sustrans.org.uk/ map-ncn. The Sustrans website also has information about the Green Wheel, a 45-mile route around Peterborough that includes traffic-free sections. Foot River and turning right towards Coldham, where the windfarm turbines were spinning at a furious rate. Riding into a strong headwind it almost felt as though I was stationary, despite the stinging pain in my legs confirming that I was actually pedalling. Leaving Coldham, there’s a section where the road is lined by rows of trees. These gave me some temporary relief from the wind as I made my way north, turning left onto Redmoor Bank just before the village of Friday Bridge. This is my favourite kind of Fen road: narrow, out of the way and mostly free from traffic. There are even a couple of twisty bits to add variety to the ride. On a calm, sunny day it would be glorious. But today it was a struggle just to stay upright. took me over a disused level crossing, across the A47 and into Wisbech via Cromwell Road. One of the good things about cycling is that it burns off a lot of calories, so scoffing cheeseburgers and cake feels like legitimate refuelling. I took on a lot of fuel. The route I’d planned to get back to March takes in Elm, Outwell, Upwell and a long stretch of the B1098 along the Sixteen Foot Drain. It’s a lovely ride I’m sure, but it will have to wait for another day. Storm Freya was just a bit too fierce, even for a Fen native like me. Instead, Mrs G answered my plea for help and came to drive me and the bike back home. The Fens will be there another day, and so will I. Beauty by Evolution March is the sister company of Evolution Beautique in Ely. Here at Evolution, we pride ourselves on giving each and every one of our clients a ﬁrst class experience. We oﬀer Massage, Facials, Nails, Waxing, Threading, Eyelash Extensions, Lash Lifting and specialise in Acne & Acne Scarring and Anti-Ageing Facials too. We also oﬀer Semi-Permanent Makeup by an accredited Colour Correction & Removal Specialist. Our highly trained and experienced Micropigmentation Technician can create your perfect look, from Classic to sultry Latino Eyeliner, Luscious lips, individual Nano Hairstroke Brows, soft ﬂuﬀy Pixel Brows or softly shaded Balyage Brows. Win a Hotel Chocolat Easter Bundle plus £50 Queensgate Gift Card Looking forward to a ‘cracking’ Easter this year? Queensgate Shopping Centre in Peterborough have everything you need to create the perfect hunt, delicious Sunday family roast and of course those all-important chocolate eggs! Whether you are after something traditional, something personalised or something out of this world- Queensgate has it all! Plus, to help you have an ‘egg-cellent’ Easter, we have a £50 Queensgate Shopping Centre Gift Card and two Hotel Chocolat Soft-Boiled Eggs (worth £10 each), to give to one lucky reader so you can treat the whole family to their Easter egg of dreams or maybe a day of Easter themed fun! you would share your prize with before April 10th. One lucky winner will be chosen at random after the date. You can also enter online through The Fens Facebook page. Just remember to include your contact details and your choice of eggs: white, milk or dark chocolate. Good luck! 5,500 BOOKS DONATED TO LOCAL CHILDREN In February I launched my fourth Read to Succeed campaign. This initiative aims to give every year 4 pupil in our 34 primary schools a book of their own for them to keep and read over the summer holidays. Since I launched this community-based project in North East Cambridgeshire it has enabled over 5,500 books to be donated to local children. This book counts as the pupil’s first book of the six to complete in the Reading Agency’s Summer Reading Challenge. This year the theme chosen is “Space Chase.” I recently held my first Arts round table meeting at March Town Hall where over 20 stake holders attended. This included the Arts Council, local arts organisations, the District Council and professional artists, to discuss how we attract more arts funding to our area and how the arts better engage our local audience. Ideas we are taking forward include creating a database so each artist submitting a funding bid does not have to duplicate the same evidence required by funding bodies when other artists have done this for their own bids. We agreed a series of other actions with a follow up meeting planned. am working closely with the Prime Minister to secure a deal, including meeting with leading European officials. Having a 6 year old and an 8 year old at home waiting to play football and talk about dancing does keep these discussions in welcome context. Who can use toning tables? Anyone who wants to lose inches without building muscle. Ideal for people who cannot or wish not to participate in strenuous activities, yet want to keep their body supple and trim. The tables can be used by anyone with heart problems, muscular or skeletal problems, arthritis or those recovering from injury. •	Ouse Washes: Wednesday 25 April, Wednesday 1 May, Wednesday 8 May & Sunday 12 May, 6.30pm-9pm •	Ouse Fen: Saturday 27 April, 6.30am-9am & Friday 10 May, 6.30pm9pm If these safaris sound like your kind of events, places are limited to three people per safari. We therefore recommend that you book soon if you would like to take part in them. The cost for these safaris is Adults £30 (nonmembers), Adults £24 (RSPB members). You can book onto these events online and I have put in the booking URL at the end of the event descriptions above. If you do not have access to the internet, please ring 01842 863403 or 07803 576410 to arrange payment. We hope that this article has inspired you to come along to one of our safaris. As well as the safaris, we also have a selection of other events planned across the Fens. Here are a few other highlights: •	RSPB Nene Washes: Dusk walks to listen for drumming snipe, corncrakes and spotted crakes. •	RSPB Ouse Fen: Early morning reedbed rambles to listen for bitterns and look for marsh harriers •	RSPB Fen Drayton Lakes (near Swavesey): Monthly Wednesday Wanders, a Dragonfly walk and two willow weaving workshops. If you would like more information about any of these events, please ring me using the contact telephone numbers listed above. Alternatively, you can e-mail me on: david.white@rspb.org.uk We hope to see you at one of our events soon! WE’RE ALL GOING ON A SUMMER HOLIDAY…? With the dark winter months now behind us, many are likely to be planning for summer holidays with the children, but for separated parents, this can be more complicated than it might appear WORDS Daniel Sims, Fraser Dawbarns Solicitor based in the Family Department them can take the children abroad for If both Mum and Dad have ‘Parental up to 28 days without permission, but Responsibility’ for the children, they have parents that do not have the benefit equal rights and responsibilities and of an Order or the agreement neither can dictate the arrangements Are you Buying, Selling or other’s Remortgaging will be committing a criminal offence for when the children are with the other under the Child Abduction Act 1984. parent. sidekick in tow and in her usual style had to show off by plunging into the only open water in the area. Seamlessly set in the tranquil wood is a rather picturesque pond, perfect for the animals and birds that reside there, not so ideal for an over excited cockapoo with an obsession with water. After fishing her out our delighted dog continued her woodland ramble with only us despairing at the prospect of taking a rather wet and smelly dog out for lunch. The trees in the wood are a mixture of ancient ash, oak and maple, with evidence of its medieval history highlighted in the woodbank, ditch and pollard oaks. The stumps of old trees are covered with a mix of moss and fungi, forming the perfect habitats for smaller creatures and invertebrate. Hollow tree trunks make ideal hiding holes and we spotted branches piled up and shaped to create dens. Ancient roots and branches make the path slightly hard to navigate but not inaccessible, although it would be much easier when the earthen floor has dried out! Thinking about lunch we hopped back in the car and drove the few miles up the road to Johnsons of Oldhurst, eager to satisfy our cravings. Indulging in a hot chocolate and slice of cake we enjoyed a rest before stocking up on groceries and Easter chocolate at their farm shop. If like us, you have taken your four-legged friend then their tea room has outside seating which is dog friendly and ideal for wet dogs to dry out! Alongside the farm complete with free roaming chickens and ducks, there is a wood which they welcome walkers to use, so if youâ&#x20AC;&#x2122;re feeling energetic and need to burn off your lunch you can continue your walk there. If you are keen to experience the beauty of bluebells and other wildflowers this spring then April is the ideal time to see these woodland wonders. Other places renowned for their bluebell displays include Ladyâ&#x20AC;&#x2122;s Wood in Upwood, Grafham Water in Huntingdon, Thorpe Wood in Peterborough and Blickling Estate in Norfolk. Tree & Landscaping Services • All types of trees topped, shaped/pruned • All varieties of hedge trimmed • Fence work undertaken • New patios laid or your existing one power cleaned • All rubbish removed from site! Also Available for Tea Dances, Ballroom, Sequence, etc. Small Business Challenges According to the Federation of Small Businesses confidence among small business owners is at its lowest point for nearly a decade. The figures are drawn from the latest Small Business Index and fly in the face of the owners’ intent to grow their businesses over the next year. Scott Bishop outlines five challenges encountered when speaking to clients with small businesses: 1. First is TIME. When planning a business, it’s important to schedule enough time for all the activities which will contribute to the smooth running of the venture. Proper preparation is key. 2. Second is creation of a CLIENT BASE. Entrepreneurs may develop fantastic ideas but they will flop when they go to market if market research has not been conducted properly. Buyers want top customer service and quality. These, lead to a positive reputation and recommendations. 3. CASH FLOW is vital to a small business and it’s often the greatest source of worry and stress for owners. We advise setting a budget, adhering to it but make allowance for any unexpected expenditure. Funding channels like grants can ease cash flow and help to finance investments which will, over the longer term, create income but have a larger financial cost in the outset. 4. Among the biggest challenge for business owners is the seemingly endless revision or introduction of LEGISLATION and REGULATIONS. It’s demanding on owners as they try to keep pace with the changes. Frequently these often relate to both the internal and external environment including recruitment, data protection, financial legislation as well as imports and exports. They impact on the operations and finances of a small business. 5. Finally, MOTIVATION. Small business owners, especially in the early days, are responsible for most operating and administrative tasks from IT to HR and everything in-between. This is the most challenging time when passion and motivation can win the day. Why not let our dedicated small business advisers in our Fenland offices help you manage your business? We have knowledge and expertise drawn from a wide range of industries and sectors. We can help with regulations, planning tips and financial support. IF YOU HAVE ANY TREE OR HEDGE WORK GET IN IF YOU HAVE ANY TREE OR HEDGE WORK GET IN IF YOU HAVE ANY TREE OR HEDGE WORK GET INQUOTE. TOUCH FOR A FREE NO OBLIGATION TOUCH FOR A FREE NO OBLIGATION QUOTE. TOUCH FOR A FREE NO OBLIGATION QUOTE. farming industry alongside exhibits of Ramsey’s local history. The museum has items on display spanning 200 years from 1740 - 1940s. The stable block focuses on local history with displays from RAF Upwood, Ramsey Fire Brigade, Ramsey Abbey school and the local police station. All the items on display have been donated by members of the public and there is certainly an impressive amount! close attention to detail and without breaking any of the green poison bottles! Next door in the parade of shops is the Cobbler’s, this family run business was on the high street of Chatteris from 1855-1988 but was kindly donated by the Paul family and rebuilt at the museum in 1990. Traditional tools spanning the 19th and 20th century line the walls, alongside a collection of leather shoes and the close attention to detail in replicating the shop really transports you back in time. Diary Dates more. With wonderful displays capturing the history of the fens and rural living, different activity trails for younger visitors and a charming tea room Ramsey Rural Museum is well worth a visit. It is open from April – October on Thursdays 10am-5pm and 2pm-5pm on weekends and bank holidays. There is a small charge to visit but this is to ensure the museum can continue running and maintain its buildings and displays. SL ID ING SHUT T ER S , SPEED D OORS ET C .
Whether you are looking to freshen up a lawn or you are putting together a whole new garden, investing in easigrass™ is a great way to transform outdoor space. We are working in your area right now and are offering a FREE measuring and estimating service. You can flavour the cream with mas hed banana instead of vanilla, or chopped str awberries or raspberries. How about using white chocolat e instead of dark or even us e your favourite chocol ate bar? PROFITEROLES WITH VANILLA CREAM AND CHOCOLATE SAUCE 1. Preheat the oven to 200C/180oC (fan) Gas 6. Line a large baking tray with baking parchment and set aside. 2. Pour 125ml water into a medium non-stick saucepan set over a low heat and add the butter. Sift the flour into a bowl and stir in the sugar and salt. Melt the butter slowly in the water, then increase the heat and bring it to the boil. As the water starts to rise up the pan, tip all the flour into the bubbling water and stir vigorously with a wooden spoon until the mixture forms a thick, smooth paste and leaves the sides of the pan (about 2-3 minutes). Tip the mix on to the baking tray and leave to cool (about 10 mins). When it’s cool, return back to the pan and add the beaten eggs, just a little at a time, beating very well between each addition. The paste should become soft and glossy. 3. The best method for the profiteroles is to pipe them with a large plain nozzle, but using two dessert spoons dipped in water is fine. You should end up with about 18 balls on the baking tray. Space them well apart to allow for rising. 4. Bake for 25-30 minutes, or until the buns are well risen and golden-brown. 5. Remove the tray from the oven. Holding each bun with a clean, dry tea towel. Turn upside down on a wire rack and make a 1cm/½inch hole in the base by twisting the tip of a knife or poking with a skewer to allow the steam to escape. Leave to cool. 6. While the profiteroles are cooling, make the cream and chocolate sauce. To make the cream, simply add all the ingredients (scraping the seeds from the pod) into a large mixing bowl and whisk until silky smooth. 7. To make the chocolate sauce, combine the cream and chocolate (broken into pieces) in a microwave safe bowl. Microwave for 30 second intervals, stirring between each until the chocolate has totally melted. Then stir in the syrup and butter. It will be glossy and rich. 8. To finish, pipe the cream into the profiteroles, place 3-4 into a bowl and cover with the chocolate sauce. ...and remember, the Tiger you drive on the road, is the Tiger you can also use on the Track ! For FULL details of any of our 6 model line up contact: Paul, Jim or Laura. place. For more information and for details of how to book your place and pay your deposit, please either send me a message, call me on 07780 628422 or email me on happyinthemomentmindfulness@ gmail.com Places are limited and we would therefore urge you to book as soon as possible to avoid disappointment. WORDS AMY CORNEY IMAGES CHRIS BRUDENELL I had set up shop within my home, still selling from the Facebook page and having open days so people could come and purchase their wares. Last year in April 2018 I had full planning consent passed to officially run the business from home with regular opening days/ times. Are you looking to improve your property?